Antique - Royal Stafford Fine Bone China, Trio Tea Setting, "Blue Willow" Pattern (RSTBLW1), Fluted, Made from 1890 to 1930's - Three Pieces. A Beautiful Antique Royal Stafford "Blue Willow" Trio Tea Setting, from The Edwardian Period. 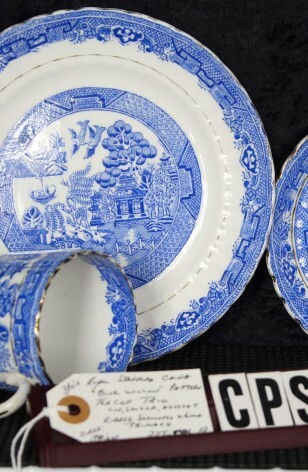 Lovely Royal Blue and White Tea Cup, Saucer, and Dessert Plate. Scalloped, Fluted. Trimmed in absolutely beautiful 22k Gold (Hand Applied). Pattern is also on the inside Rim of the Cup. A very Hard to Find Set in such a gorgeous Royal Blue. A Beautiful Antique Royal Stafford "Blue Willow" Trio Tea Setting, from The Edwardian Period. Lovely Royal Blue and White Tea Cup, Saucer, and Dessert Plate. Scalloped, Fluted. Trimmed in absolutely beautiful 22k Gold (Hand Applied). Pattern is also on the inside Rim of the Cup. A very Hard to Find Set in such a gorgeous Royal Blue. Very Good Resale Condition unless noted below or in pictures. 1 - Dessert/Bread/Tea Plate - 7 1/8"